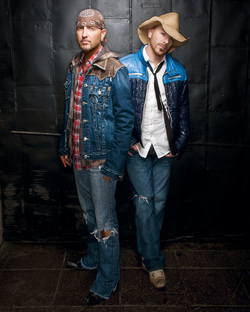 LoCash Cowboys - "You Gonna Fly"
"'YOU GONNA FLY' is a BIG FAT FREAKEN SMASH HIT! ", direct quote from LoCash Cowboys. Chris Lucas and Preston Brust aka the LoCash Cowboys, continue to amp it to the tenth degree, not only as great entertainers but as first class songwriters as well. Keith Urban's number one hit "You Gonna Fly" is proof of that fact. Co-written by Lucas, Brust, and Jaren Johnston, it is about to take over the number one spot on Billboards Country Charts. As a music journalist and album reviewer, we sometimes get to know the artists before they've made their way to radio. Every once in a while you get a special feeling about someone. I got that feeling about these guys the first time I saw them. They are mega-talented, personable, and driven. I am so going to enjoy being able to say, "I told you so" when they get their first vocal duo of the year award. last year. The tribute will take place at the Wild Horse Saloon on February 26th. The same place where they all met years ago. They are nothing less than amazing when it comes to entertaining, whether they are performing Prince's "Purple Rain" or their own song, "Livin It Up", which they always dedicate to Ryan (Troop) Jones, they are in perfect harmony with one another. I don't think they always have a play-list, they are so in sync they just do whatever comes to mind and that could be rock, soul, country, whatever it is, they leave you wanting more. They will be going on a overseas tour to Switzerland and Germany this March. Recently they have spent some time in the Sunshine state of Florida, filming for the outdoor sportsman, which is recorded from Tampa and airs this April. These two are the real deal and their message to their fans is clear, "hit us up on Facebook or Twitter and tell us all your crazy stories. We LOVE hearing them, and although we may not get much time to answer you guys back, we do everything we can to read EVERYTHING you guys write to us!" Trust me, they mean it.